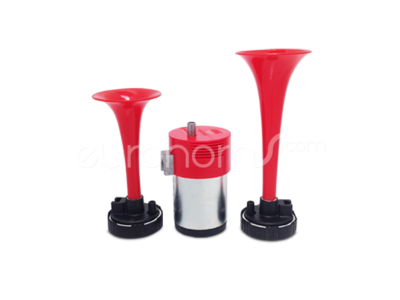 Fiamm double air horn set. M4/TA2 Sport 12v air horn kit with compressor. The type "sport" is added, because it sounds like the 70's and 80's Italian sports cars. M4 compressor, tubing, splitter, relais, and two plastic air horns. Why is it called "Sport"? double Fiamm air horn installed. This set is tuned to sound just like these.